The HP-65 was the first programmable handheld calculator in the world. Introduced by Hewlett-Packard in 1974, it was considered an electronic marvel. The HP-65 was tried on backup computations for docking maneuvers on board the NASA Apollo Space Command / Service Module in the Apollo-Soyuz missions in 1975. 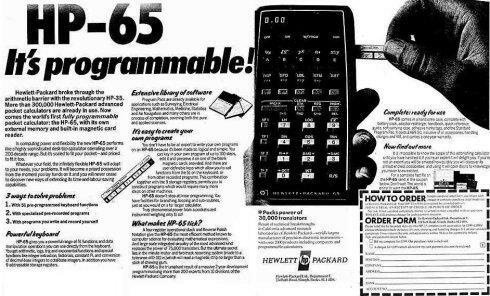 Caption: HP-65 It’s programmable! Now comes the world’s first fully programmable pocket calculator: the HP-65. with its own external memory and built-in magnetic card reader. TI&apos;s SR52 was also an early programmable, but RPN was HP&apos;s strong point especially in program mode.